Today we meet a lady to be reckoned with; a lover of pomp and ceremony, philanthropist and eventual queen, Anna Pavlovna lived a life that could never be called dull. Her Imperial Highness Grand Duchess Anna Pavlovna was born into immense privilege as the daughter of Paul I of Russia and Empress Maria Feodorovna (formerly Sophie Dorothea of Württemberg). 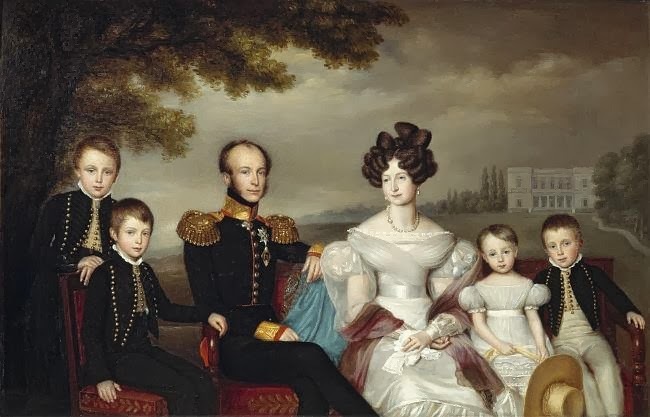 With her younger brothers, Nicholas and Michael, she was raised in seclusion by her mother at Tsarskoye Selo, where the youngsters enjoyed a varied and rich education. A noted beauty and the very model of a good dynastic match, 14 year old Anna attracted the attention of Napoleon who requested her hand in marriage. 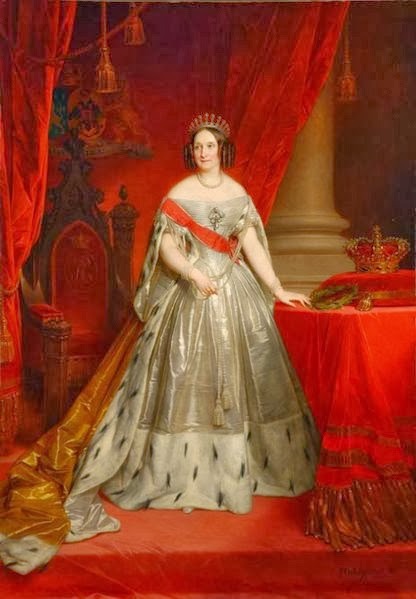 The Empress was determined that the Corsican would not marry into the Romanov dynasty and delayed her reply until Napoleon's interest faded and he turned his attentions, successfully this time, to Austrian Archduchess Marie Luise. She caught the eye of another noble gentleman in the shape of Charles Ferdinand, Duke of Berry, son of the future Charles X but when it became apparent that Anna would have to convert to Catholicism, the marriage did not occur. In fact, Anna's marital destiny lay elsewhere and when the Congress of Vienna in 1815 resulted in an alliance between Russia and the Netherlands, Anna's brother, Tsar Alexander I, suggested that she might marry William of Orange, later to become King William II of the Netherlands. William and Anna were introduced in Russia and the young lady consented to the engagement, with a lavish wedding ceremony sealing the union on 21st February 1816 at the Winter Palace in St Petersburg. The festivities continued for almost a fortnight and when they were concluded, the newlyweds remained in Russia for many months before finally travelling on. After a stopover in Berlin, the couples finally arrived in the Netherlands in summer 1816, where Anna was to experience something of a culture shock as she adjusted to the far less strict pace of the Brussels court and society in general. However, Anna came to enjoy life in Brussels and was sad to leave in 1830 when the Belgian revolution sent the court fleeing for the north. However, in her new surroundings she flourished, founding a school for poor girls and hospitals for wounded servicemen, as well as dozens of orphanages. The life of Anna and William was anything but settled and she always considered herself to have married beneath her own standing, even going so far as to accuse her husband of stealing from her to settle gambling debts. A serial adulterer with both men and women, Anna eventually separated from her husband yet the couple did have five children, four of whom survived into adulthood and Anna was a devoted mother, encouraging their education and interests. Despite their estrangement, Anna continued to advise her husband and was happy to act as an intermediary between William and his father, William I, with whom he had a fractious relationship. Despite their separation, William and Anna became King and Queen of the Netherlands on 7th October 1840 when William I abdicated, yet she was not exactly popular from the start. 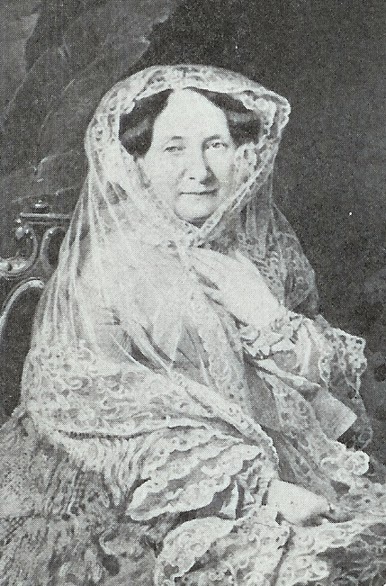 Hot-tempered and seen as elitist, Anna encouraged pomp and ceremony at court and lamented that she could not have remained in Russia, where she often visited. On the death of her husband in 1849, Anna was bereft and found it hard to come to terms with the loss of her official standing. She suffered financial difficulties as queen dowager and lived in quiet seclusion, constantly clashing with her son, King William III, and her daughter-in-law. Anna Pavlovna died of complications from a chest infection on the afternoon of 1st March 1865; following her death, she was memorialised in a traditional and lavish Russian Orthodox service of which she would surely have approved.